can be used in Agricultural, Industrial, Municipal and Residential wells to regain loss of volume and are designed to lengthen the life of the well by drastically reducing or eliminating iron bacteria buildup, corrosion and mineral scaling. These three products do not just treat the symptoms of your problem, they attack it at the source. Redi Clean Acid™ is a dry granular acid specifically designed to dissolve iron bacteria and other scales associated with water wells. The hardest problem in remediation of wells is iron bacterial incrustation and this is where other “similar” products fall short. 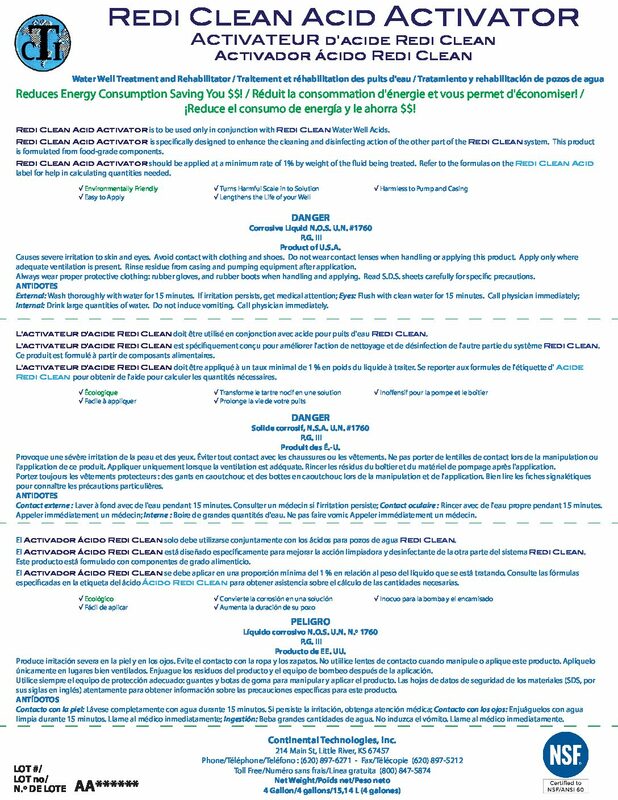 Redi Clean not only completely dissolves the iron bacteria, but the resulting PH < 2 will readily dissolve mineral deposits and other associated incrustations. This product is available in 40 lb. containers, with one 40 lb. container making 400 gallons of acid. Please fill out the form on our contact page and we will be in touch about your order. Thank you! 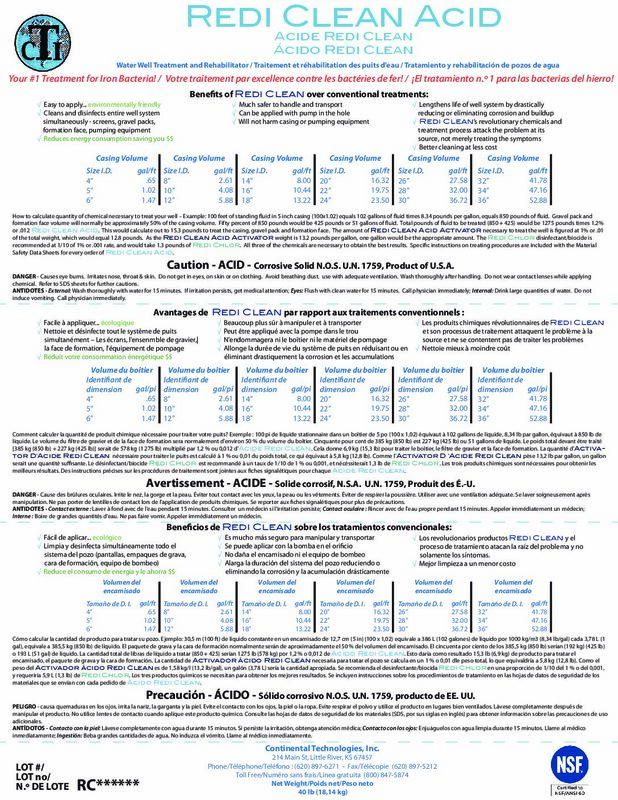 Formulated from food-grade components, Redi Clean Acid Activator™ is designed to enhance the cleaning and disinfecting properties of the Redi Clean Acid™. 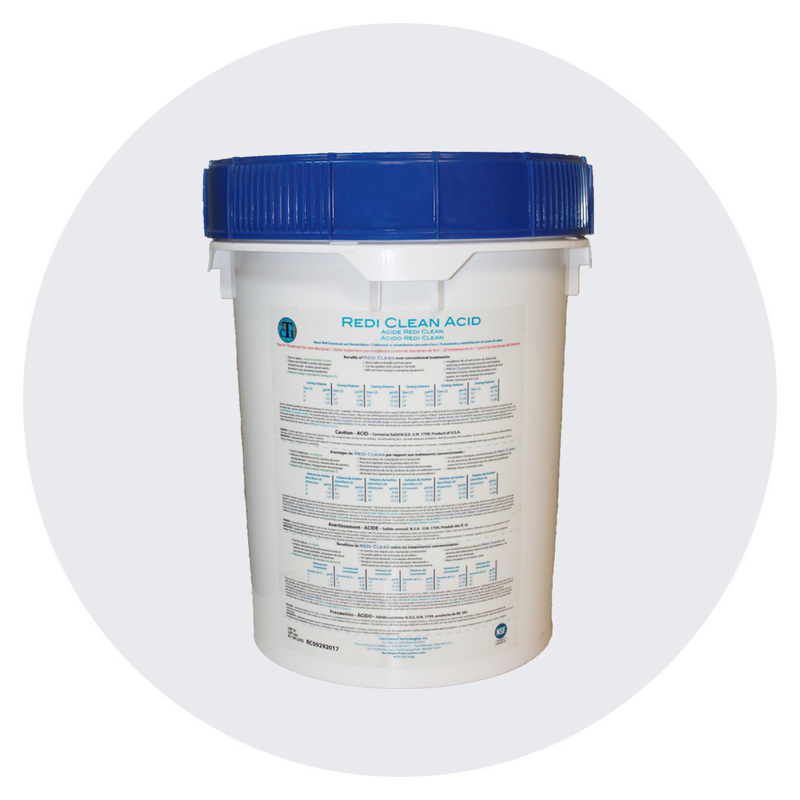 This product drives the PH of the Redi Clean Acid™ lower and holds it down longer to ensure an effective removal of mineral scale while enhancing the eradication of bacteria. Redi Clean Acid Activator™ also contains a surfactant that aides in removal of mud damage from improperly developed wells. 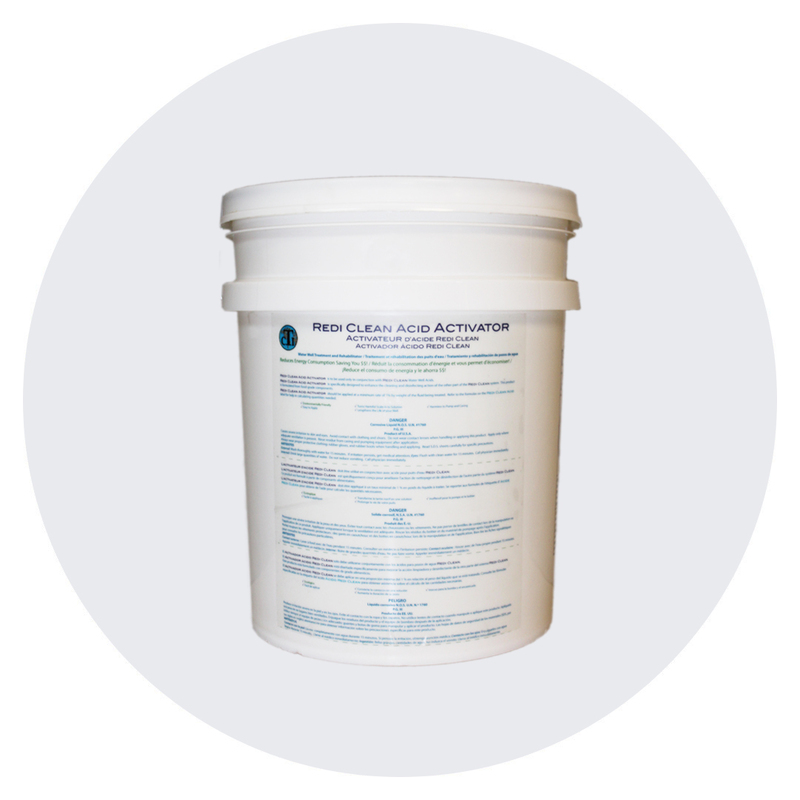 This product is available in 4 gallon containers and is used in conjunction with the 400 gallons of Redi Clean Acid™. Redi Chlor™ is a dry, granular calcium hypochlorite product and EPA registered as a biocide for disinfection of water wells. This product CAN NOT be mixed with Redi Clean Acid™ or Redi Clean Acid Activator™. It is an effective and inexpensive method for disinfection of the formation outside of the gravel pack. 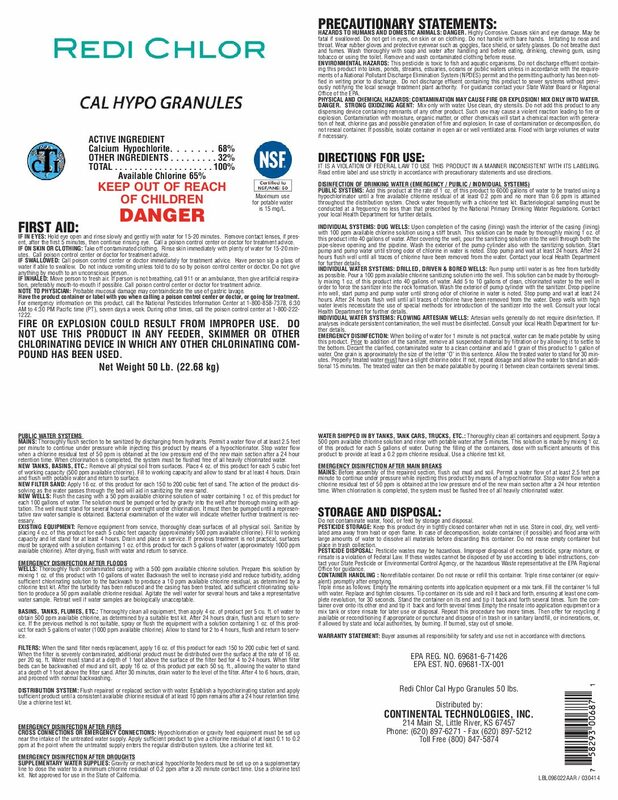 The use of this product on its own is recommended after initial remediation has occurred but should be implemented as an annual preventative maintenance program. This product is available in 25 lb. and/or 50 lb. containers, which is mixed at a rate of 1 pound per 100 gallons of water. 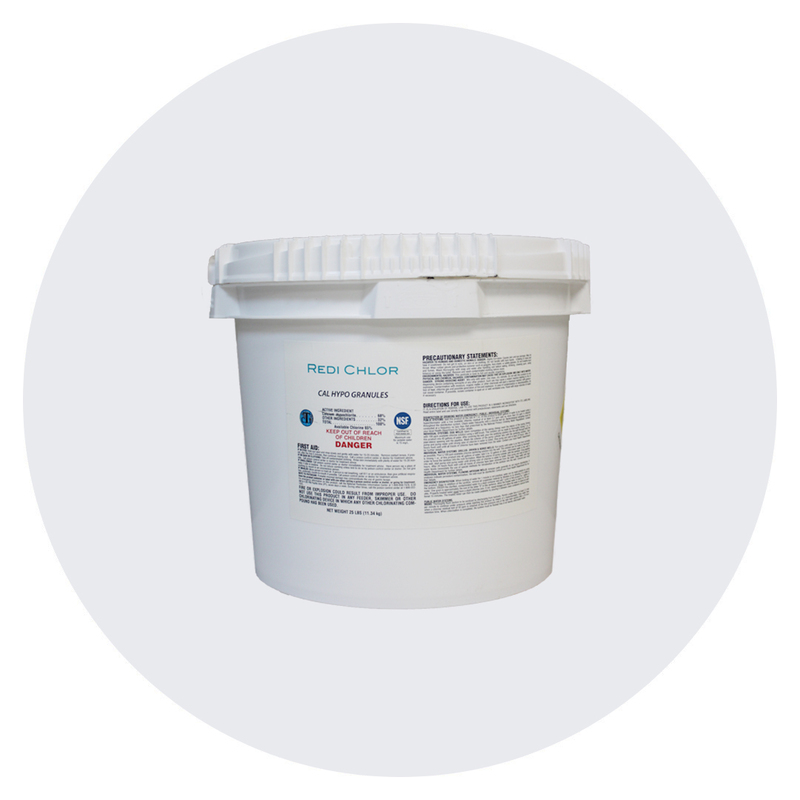 Redi Chlor™ is to be used before or after the Redi Clean Acid™ treatment, but NEVER mixed together at the surface. Review our case studies to see how our products have transformed past, as well as current, clients’ wells. We want to make sure that when a well is treated with our products that it is a successful treatment. Fill out our Well Profile Questionnaire for personalized treating instructions.